3D landmarks: 59, including National Opera of Ukraine, Kyiv National University, stadiums such as NSC Olimpiys'kyi (Kyiv), Donbas Arena (Donets'k), Arena L'viv and Metalist (Kharkiv). 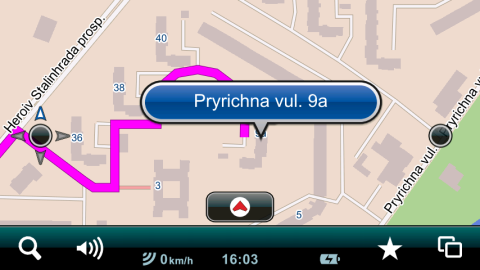 The map supports point address search and house numbers containing letters or slashes, and may route right to the building. 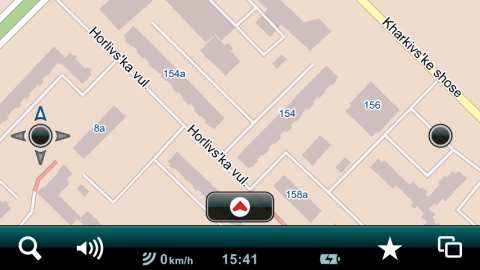 The navigation device automatically calculates an optimal route from the user’s location to a chosen place, and warns the user about the following maneuver beforehand while driving. Depending on the device model, route optimization by time or distance and setting avoidances (such as avoidance of U-turns, unpaved roads etc.) as well as calculation of complex routes are usually possible. The map contains about 82 760 Points of Interest (POIs). They are, in the first place, fuel and service stations, restaurants, hotels, banks and cash dispensers, airports, railway and bus stations, subway stations, wharves, border crossing points, historical sites, churches, theatres, cinemas, pharmacies, hospitals, state institutions etc. A lot of POIs contain contact information (phone number, postcode, address, email address and website), depending on the device model, it may be possible not only to calculate a route to the point, but to call there immediately, go to the website or send an email letter as well. The total road network coverage is increased by 400 km and constitutes 476 000 km. Odes'ka oblast': Balta, Kiliia, Rozdil'na. The total street network coverage is increased by 0.2% and now constitutes 53.6% by population. Address search covers 46.9% by population. The network of international, regional and territorial roads in Ivano-Frankivs'ka oblast', Odes'ka oblast', Zakarpats'ka oblast' and Zhytomyrs'ka oblast' has been updated. Number of POIs is increased to about 82 700. The total road network coverage is increased by 2 700 km and constitutes 476 000 km. Odes'ka oblast': Balta, Kiliia, Kotovs'k, Rozdil'na, Vesternychany, Kuial'nyk. The total street network coverage is increased by 0.4% and now constitutes 53.6% by population. Address search covers 46.9% by population. The total road network coverage is increased by 200 km and constitutes 475 800 km. The total street network coverage is increased by 0.1% and now constitutes 53.5% by population. Address search covers 46.6% by population. The network of international, regional and territorial roads in Ivano-Frankivs'ka oblast', Zakarpats'ka oblast' and Zhytomyrs'ka oblast' has been updated. Number of POIs is increased to about 82 690. The total road network coverage is increased by 2 500 km and constitutes 475 800 km. Odes'ka oblast': Kotovs'k, Vesternychany, Kuial'nyk. The total street network coverage is increased by 0.3% and now constitutes 53.5% by population. Address search covers 46.6% by population. Avtonomna Respublika Krym: Dzhankoi, Yevpatoriia, Dmytrivka, Michurinivka. Avtonomna Respublika Krym: Dzhankoi, Dmytrivka, Michurinivka. The network of international, regional and territorial roads in Zhytomyrs'ka oblast', Zakarpats'ka oblast' and Ivano-Frankivs'ka oblast' has been updated. The total road network coverage is increased by 2 300 km and constitutes 475 600 km. The total street network coverage is increased by 0.2% and now constitutes 53.4% by population. Address search covers 46.6% by population. Number of POIs is increased to about 82 670. The total road network coverage is increased by 3 000 km and constitutes 475 600 km. The total street network coverage is increased by 0.5% and now constitutes 53.4% by population. Address search covers 46.6% by population. The total road network coverage is increased by 700 km and constitutes 473 300 km. The total street network coverage is increased by 0.3% and now constitutes 53.2% by population. Address search covers 46.3% by population. The total road network coverage is increased by 7 000 km and constitutes 473 300 km. The total street network coverage is increased by 1.3% and now constitutes 53.2% by population. Address search covers 46.3% by population. The total road network coverage is increased by 2 300 km and constitutes 472 600 km. The total road network coverage is increased by 4 000 km and constitutes 470 300 km. The total road network coverage is increased by 4 400 km and constitutes 466 300 km. The total road network coverage is increased by 3 900 km and constitutes 461 900 km. 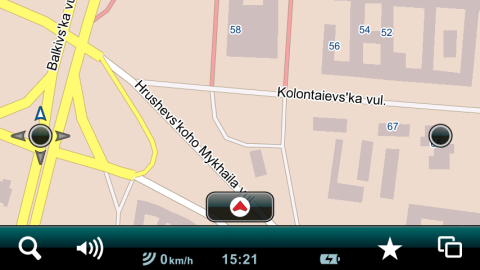 Lane guidance coverage in Kyiv is enhanced. The total road network coverage is increased by 12 600 km and constitutes 461 900 km. Support of Russian as a 3rd language added. The total road network coverage is increased by 2 800 km and constitutes 458 000 km. The total road network coverage is increased by 5 900 km and constitutes 455 200 km. 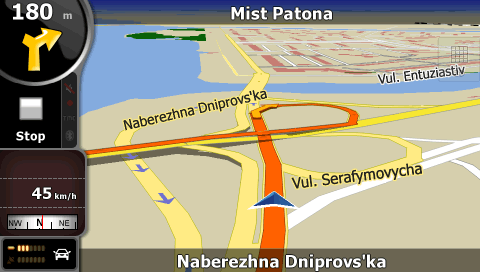 Substantially updated street network and address database for the city of Dnipropetrovs'k including adding in-block passages based on our unique car GPS/video survey data captured recently. Added building footprints with numbers and elevations, substantially updated street network and address database for the city of Ternopil'. Updated interconnect network coverage in Lvivs'ka and Chernivets'ka regions. The total road network coverage is increased by 8 600 km and constitutes 455 200 km. Substantially updated street networks and address databases for the cities of Kharkiv and Dnipropetrovs'k including adding in-block passages based on our unique car GPS/video survey data captured recently. The total road network coverage is increased by 2 700 km and constitutes 449 300 km. 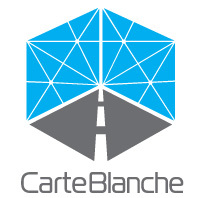 Substantially updated street network and address database for the city of Kharkiv including adding in-block passages based on our unique car GPS/video survey data captured recently. The total road network coverage is increased by 6 100 km and constitutes 446 600 km. The total street network coverage is increased by 1.1% and now constitutes 48.7% by population. Address search covers 42.8% by population. Number of POIs is increased to about 73 000. The total road network coverage is increased by 8 200 km and constitutes 446 600 km. The total street network coverage is increased by 1.3% and now constitutes 48.7% by population. Address search covers 42.8% by population. The total road network coverage is increased by 2 100 km and constitutes 440 500 km. The total street network coverage is increased by 0.2% and now constitutes 47.6% by population. Address search covers 42.0% by population. Street network and address database for Rivne substantially updated. The total road network coverage is increased by 4 500 km and constitutes 438 400 km. Sums'ka oblast': Kosivschyna, Pischane, Tokari, Verkhnie Pischane, Sad. The total street network coverage is increased by 0.6% and now constitutes 47.4% by population. Address search covers 41.8% by population. Street network and address database for Ivano-Frankivs'k, Sumy and Kherson substantially updated. Sums'ka oblast': Sumy, Pischane, Verkhnie Pischane. Number of POIs is increased to about 67 400. The total road network coverage is increased by 6 400 km and constitutes 433 900 km. The total street network coverage is increased by 1.5% and now constitutes 46.8% by population. Address search covers 41.4% by population. Street network and address database for Bila Tserkva, Khmel'nyts'kyi and Zhytomyr substantially updated. Number of POIs is increased to more than 64 200. The total road network coverage is increased by 3 200 km and constitutes 427 500 km. Ternopil's'ka oblast': Berezhany, Buchach, Chortkiv, Kremenets', Terebovlia, Zbarazh, Rai. The total street network coverage is increased by 0.9% and now constitutes 45.3% by population. Address search covers 40.7% by population. Street network and address database substantially updated for the cities of Poltava and Vasyl'kiv. Partial update of address database in Kyiv based on our pedestrian GPS/photo survey. Building footprints added for the city of Poltava. Introduced time dependent driving restrictions. Increased number of intersections in Kyiv covered with lane information. Additionally captured about 400 grade separated crossings to allow proper 3D visualization. Number of POIs is increased to more than 62 200. The total road network coverage is increased by 5 700 km and constitutes 427 500 km. The total street network coverage is increased by 2.3% and now constitutes 45.3% by population. Address search covers 40.7% by population. The total road network coverage is increased by 2 500 km and constitutes 424 300 km. The total street network coverage is increased by 1.4% and now constitutes 44.4% by population. Address search covers 40.5% by population. Number of POIs is increased to almost 55 200. The total road network coverage is increased by 5 900 km and constitutes 424 300 km. The total street network coverage is increased by 3.0% and now constitutes 44.4% by population. Address search covers 40.5% by population. Street network and address database substantially updated for the cities of Brovary and Kirovohrad. Signpost information – available for Kyiv–Boryspil’ highway. The total road network coverage is increased by 3 400 km and constitutes 421 800 km. Ivano-Frankivs'ka oblast': Yaremche, Horodenka, Kalush, Kolomyia, Nadvirna, Rohatyn, Sniatyn, Kotykivka. Kyivs'ka oblast': Slavutych, Kalynivka, Kalyta, Velyka Dymerka, Bervytsia, Bobryk, Bohdanivka, Dymytrove, Frunzivka, Hoholiv, Hrebel'ky, Kniazhychi, Krasylivka, Kuibysheve, Kulazhyntsi, Litky, Litochky, Mokrets', Mykhailivka, Opanasiv, Peremoha, Peremozhets', Pershe Travnia, Pershotravneve, Pidlissia, Ploske, Pohreby, Pukhivka, Rozhivka, Rozhny, Rudnia, Rusaniv, Semypolky, Shevchenkove, Skybyn, Sobolivka, Svityl'nia, Tarasivka, Trebukhiv, Vil'ne, Zakharivka, Zalissia, Zavorychi, Zazym`ia, Zherdova, Zoria. Kirovohrad's'ka oblast': Nove, Cherniakhivka, Novopetrivka, Sokolivs'ke, Soniachne. The total street network coverage is increased by 1.6% and now constitutes 43.0% by population. Address search covers 40.4% by population. Building footprints added for 6 settlements in Kirovohrad's'ka oblast': Kirovohrad, Nove, Cherniakhivka, Novopetrivka, Sokolivs'ke, Soniachne. Number of POIs is increased to almost 54 500. The road network throughout Ukraine, including both national roads and the streets and roads within some cities, has been significantly updated and expanded. The total length of the street-road network is increased by 1.8 times, 170 detailed road junctions added. Detailed coverage with building footprints and address search added in 5 settlements: Dniprodzerzhyns’k (Dnipropetrovs’ka obl. ), Kremenchuck (Poltavs’ka obl. ), Smila (Cherkas’ka obl. ), Illichivs’k and Mizikevycha (Odes’ka obl.). Added detailed coverage, including street address search, for 6 cities: Berdychiv, Kam'ianets'-Podil's'kyi, Mariupol', Melitopol', Myrhorod and Uman'. Added detailed coverage, including street address search, for 4 cities: Vinnytsia, Ternopil', Kryvyi Rih and Bila Tserkva, Bila Tserkva and Vinnytsia with building footprints. 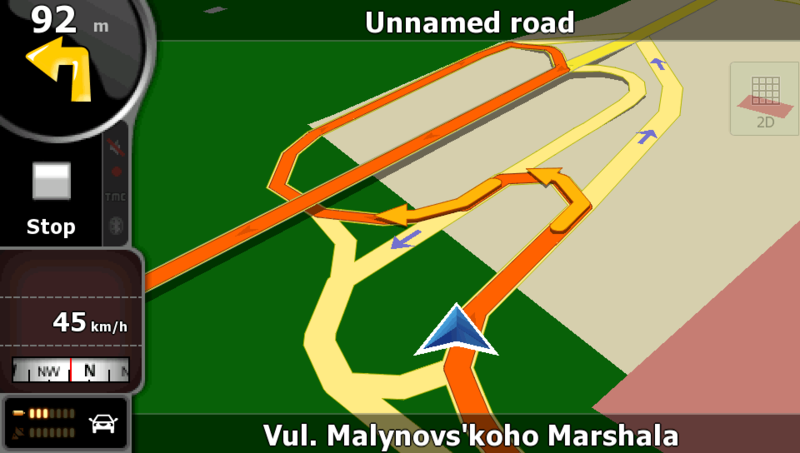 Substantially updated and enhanced street road network in Kyiv and suburbs. We did not limit ourselves to just roads for cars but added also many unpaved roads, park alleys and forest openings that hopefully will be useful for bicycle and pedestrian tourists. Added building footprints for Kyiv, Bila Tserkva, Boryspil', Brovary, Irpin', Obukhiv, Ukrainka, Vinnytsia, Kotsiubyns'ke and Pliuty. Added more than 40 detailed road junctions in Dnipropetrovs'ka, Kyivs'ka, Ternopil's'ka, Vinnyts'ka and Volyns'ka regions. Added about 1000 Points of Interest, in particular, a large number of fuel stations, including some fuel station networks in Kyiv and Krym. Added practically all points of the national supermarket networks “Sil’po”, “Vopak” and “Velyka Lozhka”, including addresses and contact phone numbers of the shops. Names of border crossing points are brought to a single standard, with data on the name of the point on both sides of the border, country codes and types of transport, if the border can not be crossed by car in the point. Е95 lane given in detail. It is now shown in two lines, for both traffic directions practically along its whole length, from the Belarus border to Odesa. All two-level road junctions, as well as U-turns and intersections, are also given in detail. Route calculation is performed with regard of road signs and lane information. 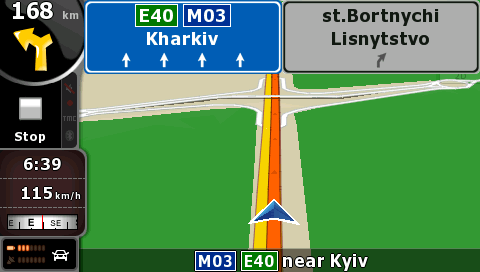 A part of E40 lane from Kyiv to Boryspil’ airport is also given in detail. The road type corresponding with highway is assigned to this part of the road. Numerous corrections of the road network all over Ukraine.